As life goes on we face sadness in minor forms at different stages. Persistent long-term grief is depression. Some of us might have seen that phase of life too when we had chronic depression. Depression during pregnancy is one such scourge which affects many women. 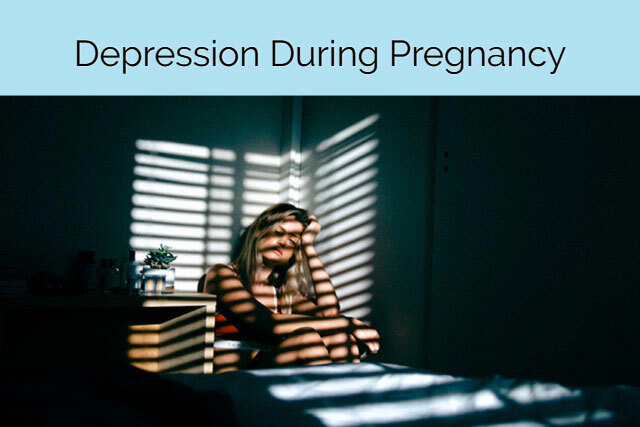 The American Congress of Obstetricians and Gynecologists conducted a research in which they found that about 14-23% women deal with depression during pregnancy. It is a huge percentage. It is critical to manage depression during this time as it directly affects your baby. Similarly, anxiety during pregnancy is also a common occurrence. So, how do we deal with depression while pregnant? What is depression While Pregnant? What are the causes of depression during pregnancy? Can depression during pregnancy harm the baby? How to cope with depression during pregnancy? What is the treatment for depression during pregnancy? Can dads experience depression after the baby arrives? Many women have to struggle a lot with getting pregnant. It is natural to have a sense of despair when you are trying to get pregnant for long. Dealing with anxiety while trying to get pregnant is not only on the part of the female. In fact, the male partner has to face and deal with hidden depression. The consequences are severe and noticeable in case of women because they have to bear a baby. To the surprise of such couples, it is the same anxiety that further plays down their chances of being pregnant. Stress and anxiety are risk factors for infertility in women and men. The situation is so severe that it is difficult to prevent anxiety. Albeit there is nothing that makes a female less of a woman if she cannot make babies, most women feel it. There is Assisted Reproductive Technology to help out such woman overcome this depression. Infertility treatments involve a lot of risks and are expensive. If not successful they may accentuate the underlying depression while trying to get pregnant. Dealing with anxiety during pregnancy is difficult. In most cases, it remains undiagnosed. Women and kin feel that it is the pregnancy hormonal imbalance that is causing such behavior. However, now with growing awareness and available options more women feel free to contact their counselors. Depression in pregnancy is a category of mood disorder due to change in chemical coordination of brain. Other mood disorders are obsessive-compulsive disorder and panic disorder. It is also known as antepartum depression. The key point to differentiate sadness from depression is the duration of mental state. Depression is persistent sadness. After a pregnant woman experiences the symptoms for more than two weeks she is considered for being depressed. Risks of depression during pregnancy are equally distributed between the baby and mother. A woman who is depressed during pregnancy might resort to drugs and alcohol. Both are incredibly harmful to the baby. Risks for untreated anxiety and depression include preterm delivery and low birth weight. The mother is at a higher risk of postpartum depression if she is dealing with depression while pregnant. Bonding with the baby also is hard for her. She will not take care of her health and diet. It can lead to miscarriage. Stress can worsen the depression during pregnancy. Depression during pregnancy has both direct and indirect effects on the baby. A depressed mother will not take care of herself. In severe conditions of antepartum depression, she may have suicidal thoughts and self-harm acts. In these conditions, the baby will be adversely affected. Especially at later stages pregnancy when the baby is formed and can respond to stimuli, these dangers increase. Babies of mothers having depression during pregnancy have problems concentrating. These children are less active and are irritable. They may keep crying or be silent. Such children may also have difficulty while learning and have behavioral problems. Mothers who are depressed have more chance of undergoing a C-section surgery. Coping with depression during pregnancy is mainly achieved with a strong will to do it. You must speak to your prenatal caretaker and counselor. A woman who has a history of depression are more likely to have depression during pregnancy. Dealing with depression while pregnant also maybe because of having marital problems. You need to sort these things by taking necessary help. Safe medications for dealing with depression while pregnant are not recommended. There are reports stating that taking antidepressants can affect your pregnancy. However, if the depression stage is extreme, then you need to compare the consequences of both conditions. Taking antidepressants and having a healthy pregnancy is better. The risk of leaving antidepressants and having a relapse is too significant to take. It is better against the harms of untreated depression during pregnancy. Read more: Can Zoloft Affect Pregnancy Test? Psychological therapy: A qualified prenatal depression counselor will help you change your mindset. Regular counseling sessions will improve your condition. Light therapy: In this therapy doctors use sunlight exposure. Light therapy is a natural way of dealing with depression while pregnant. The doctor takes the pregnant woman out in the sun at different times. Acupuncture: It is the ancient Chinese method of treating any disorder by activating the pressure points. Depression and other things are also treatable using Acupuncture. Dietary changes and a workout routine act as supportive therapy. Often fathers coping with financial crisis or issues while raising their child have episodes of depression. Always remember that trigger of depression is not hormonal in dads. If you’re able to be mentally healthy you’ll be able to save him and your baby too. Including more omega-3 fatty acids in diet: Omega 3 fatty acids increase the production of good hormones in the body. They suppress the depressive hormones and reduce catalytic activity. Sardines and salmon are rich sources of omega-3 fatty acids. Exercising: Exercising helps keep the body healthy and improves blood circulation. It also prevents other health problems of pregnancy. Socialising: One needs to go out and meet people going through a similar situation in life. It is important to meet other women who are mothers and talk to them. Isolating yourself is the worst step during the depression. Herbs for dealing with depression while pregnant: Herbs that have magnesium and vitamin B6 help to deal with depression while pregnant. They improve immunity and digestive processes. Giving rest to mind and body: Inadequate sleep causes other problems. Even if you are lying down, worrying and thinking negative, then it does more harm. It is better to fix your time for sleeping. Be optimistic: It is the only solution for depression. Bad times will end. Even they will get tired of your positivity!! Researches show that mothers who discontinued antidepressants during pregnancy have a relapse. This was worse than the cases where the woman continued her prescription even during pregnancy. Refer to National Child and Maternal Health Education Programme for dissemination of latest research on Postpartum Depression ‘Moms Mental Health Matters’ 3 Always consult your gynecologist even after reading anything and taking any step. Prescription discontinuation is something that’s best left to them. Depression and stress are potent silent killers. Moreover, nobody knows it that you are suffering from it! Previous articleCan I Take Pregnancy Test At Night?